Malpuas are rich, soft filigreed pancakes. 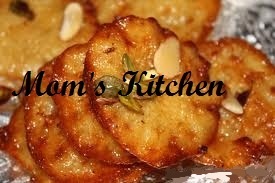 The pancake (malpua) batter are sweetened as in this recipe or the fried malpuas can be soaked in a saffron flavoured syrup. Pancake (malpuas) are a special feature in festivals. Combine all the ingredients in a bowl and add approx. 1½ cups of warm water. Mix well to make a smooth batter. Leave aside for 45 minutes. Heat ghee in a shallow kadhai (the ghee should be approximately 25 mm. (1") deep). Pour a spoonful of the batter into the hot ghee and deep fry over a medium flame. Cook on both sides till the malpua is golden brown. Repeat steps 3 and 4 for the remaining batter. Serve hot, garnished with pistachios.